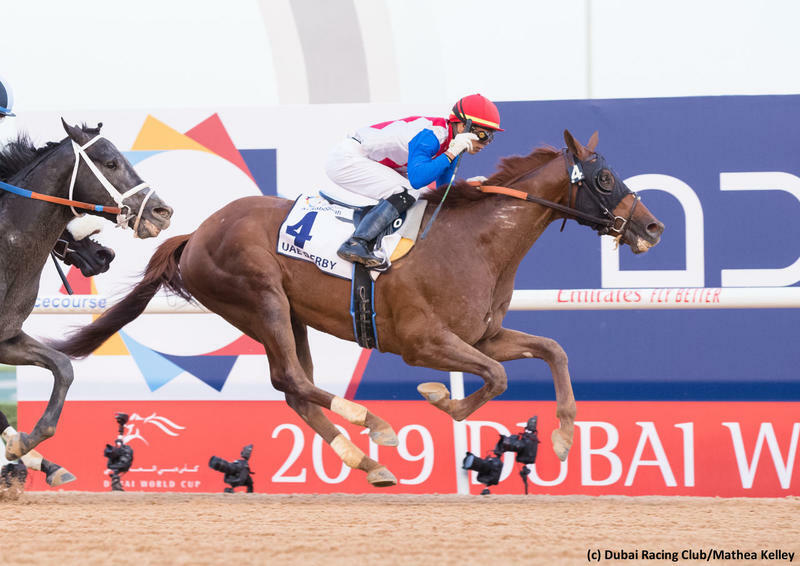 Imperial Racing LLC’s Plus Que Parfait picked up his first stakes win with a sharp closing run in Saturday’s $2.5 million UAE Derby (Uae-G2) at Meydan. With his tally, the sophomore picked up 100 points on the Road to the Kentucky Derby to assure his slot in the Run for the Roses on May 4 at Churchill Downs. The chestnut colt was unveiled in the summer in a maiden special weight event on the lawn at Ellis Park. Sent postward at 10-1 odds on debut, the Brendan Walsh pupil overcame a wide post to finish a solid third. The winner of the race, Henley’s Joy, came back to win the Kentucky Downs Juvenile Stakes next out and was also victorious in the Pulpit Stakes. Plus Que Parfait appeared at Churchill Downs on the dirt in September and finished a solid third once again. The Kentucky-bred graduated third time out with a nose tally going two turns at Keeneland in what has turned out to be a serious maiden contest. Holy Bull (G2) winner Harvey Wallbanger was runner-up on the day and Sunland Derby (G3) victor Cutting Humor came home third in that loaded event. Plus Que Parfait jumped into the stakes ranks following his maiden score and made a fine late run to finish a half-length second in the Kentucky Jockey Club Stakes (G2) at Churchill Downs. In 2019 leading up to his desert triumph, the ridgling came home fifth in the Lecomte Stakes (G3), which was followed by an uncharacteristic 13th in the Risen Star Stakes (G2). Plus Que Parfait’s affinity for running long is no surprise being by Point of Entry and out of an Awesome Again mare, as both supplies a good measure of stamina. He is the first registered stakes winner out of Belvedera, who is a half-sister to 1999 Canadian Oaks heroine Touch Dial. It is difficult for me to back Plus Que Parfait with any confidence in the Triple Crown at this stage of his development. I did admire his strong rally en route to victory at Meydan, however his prior 2019 form left something to be desired, to say the least. The field for the 2019 UAE Derby was far from stellar, as well. The talented three-year-old will be asked to deliver a top performance at Churchill Downs after shipping back from Dubai with a quick turnaround. Plus Que Parfait appears to be a Kentucky Derby outsider right now.